Colostrum is generated just prior to calving in order to transfer protective antibodies from the dam to the calf (passive immunity). Good quality colostrum can protect the newborn calf from diseases until its immune system can produce its own antibodies. The chart in Figure 1 shows a general concept of the amount of antibodies a calf receives when given 2 quarts vs. 4 quarts of colostrum. The most crucial period of a calf’s life is the first two weeks. Colostrum is largely comprised of protein, fat, and antibodies. The amount of antibodies absorbed by the calf will determine the degree of protection from disease. Testing the level of IgG’s in colostrum will help determine its quality. There are different types of colostrum testing devices on the market. 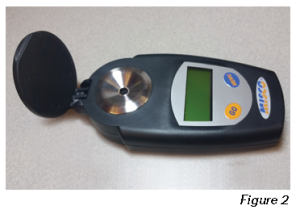 A digital Brix handheld refractometer (See Figure 2) is recommended for its ease of use and accuracy. To test colostrum on this meter turn it on by pressing the “Go” button and place a few drops of thoroughly mixed colostrum into the sample well on the meter, close the lid and press the “Go” button once again. A brix value will read out on the screen. For a detailed video on how to test colostrum using a digital refractometer visit www.crystalcreeknatural.com and select the “VIDEO” option from the menu under our “NEWS & RESOURCES” tab. Colostrum should be fed to the calf within the first 4 hours of life to optimize the absorption of IgG’s (antibodies). The general concept of antibody absorption in the first 12 hours of a calf’s life is shown in Figure 3. Colostrum should be delivered to the calf at a temperature of 101-103˚F. The goal of a successful colostrum program is to feed a minimum of 200 grams IgG’s, ensuring that adequate amounts of antibodies have been supplied to the calf. A Brix value of 23% is equivalent to 50 grams of IgG/quart. Feeding 4 quarts of this 23% Brix colostrum will deliver 200g IgG to the calf. See the “Colostrum Quality Interpretation” chart on our website under the “NEWS & RESOURCES” “TECHNICAL INFORMATION” selection to determine the IgG concentration from the brix value of a colostrum sample. Research has shown that 2 quarts of colostrum is not enough for a healthy calf. 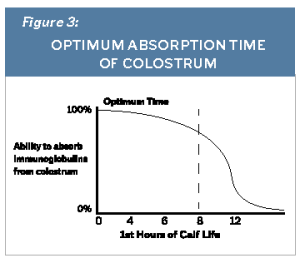 Figure 4 illustrates the benefits of providing a 4 quart vs. 2 quart feeding of colostrum. The success of a colostrum program is monitored by total protein testing. Total protein samples should be taken from calves between 24 hours to 7 days of age. A result of less than 5.4 g/dL of serum protein indicates failure of passive transfer. This means the calf did not absorb enough antibodies to adequately protect themselves from disease. Calves with failure of passive transfer are 3-10 times more likely to become sick before weaning when compared to calves with adequate antibody levels1. In addition to disease protection, feeding the proper amount and quality of maternal colostrum has been proven to show an increase in the average daily gain and feed efficiency over calves with failure of passive transfer. Adequate test numbers are anything greater than 5.4 and ideally closer to 6.0g/dL for an indicator of a successful passive transfer of immunity. Calves fed correctly managed colostrum see a higher lifetime milk production than those without. In fact, studies show that calves fed the proper quality and quantity of maternal colostrum have produced an increase of 1,131 pounds more milk yield through their first lactation2. Proper colostrum management is important for overall calf health and future milk production. Having a successful colostrum management plan will save money on vet bills and treatment costs. Once your calves are off to a great start, continue their growth and development with Crystal Creek® Swift Start® calf products such as milk replacer, texturized calf feed, calf pellets or calf and heifer mineral. For more information check us out at www.crystalcreeknatural.com or give us a call at 1-888-376-6777. 1 The Merck Veterinary Manual. 9th Edition, 2005, Print. “Back to Basics: Economics of Health & Accelerated Calf Growth” Dr. Mike Van Amburgh, Cornell University.